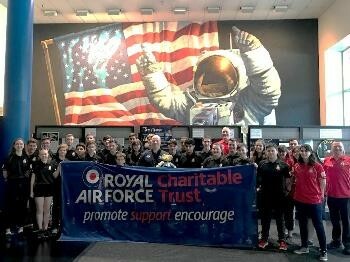 Air cadets from Sussex Wing ATC were able to reach for the stars thanks to a RAF Charitable Trust grant which enabled them to undertake a STEM (Science, Technology, Engineering and Maths) trip to the National Aeronautics and Space Administration (NASA). The trip saw 25 air cadets, representing 20 out of 22 squadrons, travel to the Johnson Space Center, Houston in April and participate in the Space Center University programme, alongside astronauts and the team from the Astronaut Training Programme. The initiative, part-funded by the £3,750 grant, was designed to meet the nationwide Air Cadets STEM strategy and establish a legacy for future generations of cadets by combining the cadet experience with the history and training of the NASA space programme. Expedition organiser Flt Lt Dave Hill said: "The trip was a unique and exciting opportunity that played directly to the RAF Air Cadets' adventure motto and was aligned with the national agenda to foster STEM links and experiences. "The programme reached across the whole Wing, offering a genuine opportunity for cadets to be challenged appropriately with an excellent syllabus of STEM related projects." The programme included a series of lectures on space travel as well as team leadership tasks, practical tasks - such as planning a Mars colony mission - and the opportunity to experience 'zero gravity' in the training pool. Upon completion of the programme, the cadets gained a 'graduation' certificate from NASA. Air Cadet Emily Rowe, who hopes to become a mechanical engineer, said: "The programme [was] just another STEM building block on the path toward my goal." Air Cadet Millie Bulgin added: "The trip provided a great insight into how NASA works and the teamwork and STEM learning that was encouraged will help me with my college education." The cadets have since benefited from being able to apply the STEM training that they received to their BTEC Aviation Studies, enhancing subject delivery at squadron level and overall knowledge across the Wing.